Love was in the for the Dancing With The Stars cast this weekend! 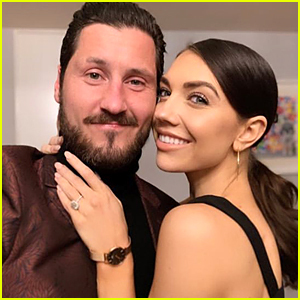 Tons of dancers came to show their support for Val Chmerkovskiy and Jenna Johnson as they walked down the aisle, including pro Alan Bernsten. After the celebration, Alan took to his Instagram to joke about being single and share some cute solo photo booth pics. “Another wedding, another photo booth alone 😂 congrats @dance10jenna and @valentin I love you both so much!” Alan captioned the pics, where he can be seen carrying a bouquet. Alan was most recently linked to his DWTS partner Alexis Ren but the pair have gone their separate ways. We know Alan is going to find the perfect wedding date soon! Another wedding, another photo booth alone 😂 congrats @dance10jenna and @valentin I love you both so much! The Dancing with the Stars pros tied the knot in front of 200 friends and family members on Saturday (April 13) at the Terranea Resort in Rancho Palo Verdes, Calif. The groom looked handsome in a black, velvet Brooks Brothers tux while the bride donned a Vera Wang gown for their big day. Members of Jenna‘s bridal party included her former DWTS partner Adam Rippon along with dancing pro Lindsay Arnold. Val‘s brother Maksim Chmerkovskiy served as Best Man. 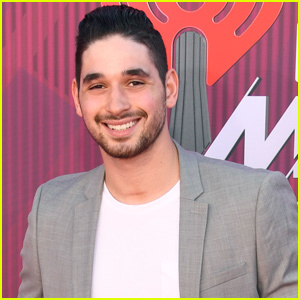 Guests at the wedding included DWTS pros Hayley Erbert, Witney Carson, Emma Slater, Sasha Farber, Mark Ballas, Cheryl Burke, Alan Bersten, Artem Chigvintsev, and Brandon Armstrong. Also at the wedding were Nikki Bella and Alfonso Ribeiro as well as Val and Jenna’s former partners Rumer Willis, Joe Amabile, Normani Kordei, Laurie Hernandez, Ginger Zee, and Tamar Braxton. Jenna Johnson and Val Chmerkovskiy have us craving more after they both shared a short glimpse at fiery dance on Instagram. The engaged couple showed off their amazing dance skills in the new video, and it will make you want to sign up for lessons asap. Jenna also hinted that she and Val were working towards a spot at Blackpool, which is the world’s first and most famous annual ballroom dance competition. Jenna and Val are set to marry later this year. 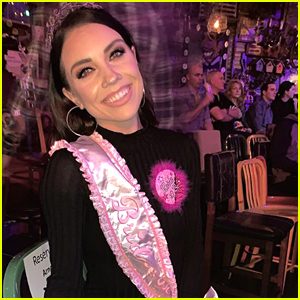 It was an amazing night for Jenna Johnson who celebrated her bachelorette party with her DWTS BFFs! Lindsay Arnold, Emma Slater, Britt Stewart, Witney Carson, and Hayley Erbert all teamed up to throw Jenna a fun party, just as the Dancing With The Stars tour is wrapping up. The six ladies headed to Vegas for a fun night and even stopped by to see Absinthe. Jenna and fiance Val Chmerkovskiy are planning to wed later this spring. This is everything. WE LOVE YOU @dance10jenna 🎉 celebrating you tonight!